Alborz Hotel Tehran is located in Vesal Street. Vesal Street has got a good location: it is in close proximity to both Enghelab and Valiasr Streets. By staying at this hotel, you can have easy access to all different parts of the capital. If you’re interested in cultural activities, Alborz Hotel is a perfect choice for you. You have access to Enghelab Street with its numerous bookstores and the University of Tehran from one side, and from the other side, Valiasr Junction, City Theater, the cafes, etc. are within reach, and you can get to Keshavarz Boulevard, one of the most charming streets in the capital, through a five-minute walk. Laleh Park and the Museum of Contemporary Arts are in close proximity as well. 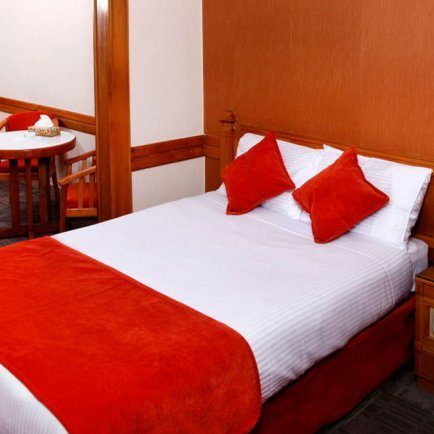 By choosing Alborz Hotel, you will be staying at the cultural heart of the capital. The facilities of this hotel have always kept the guests satisfied, trying hard to secure a pleasant memory of your stay in your mind. "